This day of love spurred Pinterest to talk about weddings. 40 million people incorporate Pinterest into their wedding planning each year. Pinners save 900 million wedding-related Pins annually and conduct 378 million wedding-related searches. 27 percent of pinners plan for their weddings several times per day, compared with 18 percent of non-pinners. 81 percent of engaged pinners said they began planning on Pinterest before the question was even popped. They start using Pinterest earlier than other wedding sites, when they’re still in discovery mode and looking for ideas that spark their interest. Over time, they move into decision-making mode and use their favorite Pins to bring their vision to life. A recent study with research firm DeepFocus showed that Pinners are more involved wedding planners than non-Pinners. They put more thought into the components that make up their wedding’s character, like attire, color palette and décor. They also search for more types of information than non-Pinners. What’s the first thing Pinners think about? Their dress, of course. 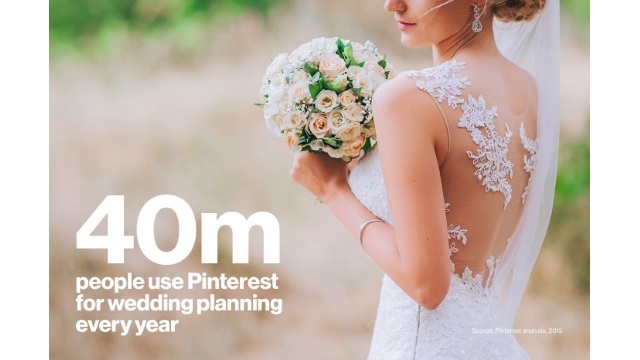 That makes Pinterest a crucial marketing tool for David’s Bridal, which uses Pinterest to reach people early when they’re seeking inspiration and open to new brands. David’s Bridal does much more than help brides say yes to a dress: Its products span everything from shoes to stationary. To show this breadth and build awareness with detail-oriented brides, the team created the “Be Your Own Bride” quiz. The quiz integrates David’s Bridal content with Pinterest’s API (application-programming interface) so people can dream up their perfect wedding. David’s Bridal will be using Promoted Pins to surface the quiz on Pinterest, and it also linked to the quiz from its own website. Quiz questions cover a range of wedding topics, from color preferences to dress styles. The answers populate a custom board with Pins for personalized invitations, wedding themes and more. The “Be Your Own Bride” quiz links to a broader campaign that encourages women to put a personal spin on their weddings. Readers: Was (or is) Pinterest part of your wedding planning?